The 3-wheeler has hit another hiatus in forward progress, a change from the twin-cylinder Honda Rebel engine back to the original plan for a single cylinder Suzuki Skywave (Burgman) scooter engine with automatic transmission. 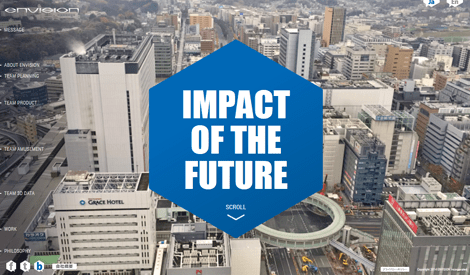 Sayonara for now… I’m sure Mr. H already has something in mind for the rebirth of the Rebel engine in one of his own projects. Up until the decision to change over, we had been making progress on the outer panels. 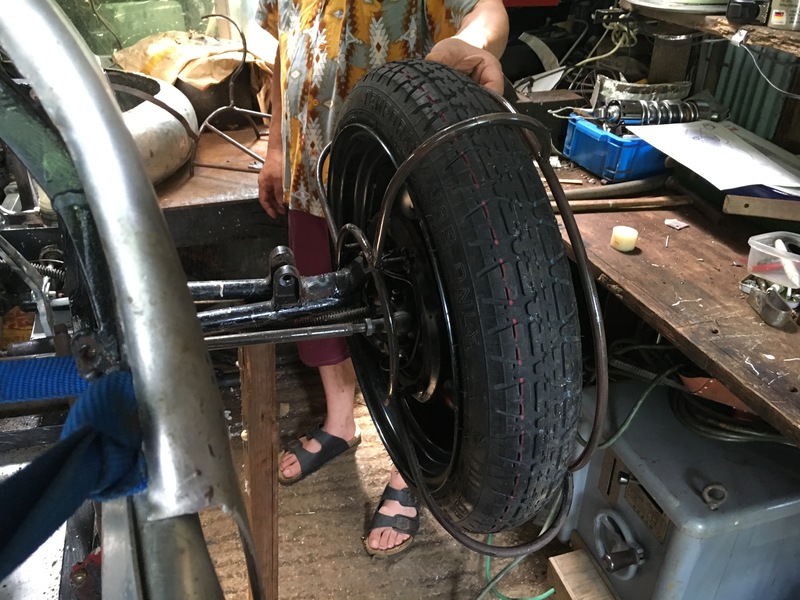 We have agreed on using fixed cycle fenders for the front wheels and Mr. H had mocked up the right-side fender mount, followed by shaping the fender ready for trimming to size. Haruyama-san also mocked-up a front A-arm mounted version but recommended against it from experience, because of vibration problems. First bash at a fender, it will be trimmed to size and shape from here. Side view, showing the Rebel engine still in place. 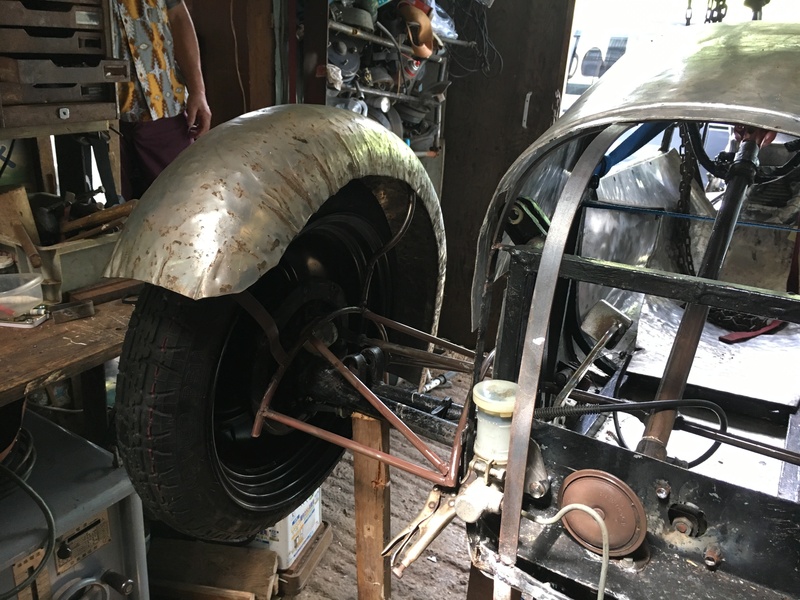 The fixed fender will need more clearance but, if it was good enough for Ettore Bugatti on the Type-35, it’s good enough for me. I decided to ask Mr. H to make the engine change to the Suzuki Skywave unit with automatic transmission because, being an old dog averse to new tricks, not to mention a non-biker, I have been wary of the combination of a left-hand-operated sequential gear and clutch mechanism combined with the right-hand-operated throttle on the steering handlebar. Given some time I am sure I could learn to use it smoothly but it would be a barrier to other people taking the trike for a quick spin and I am not confident that I could get out of an emergency with both hands so busy! 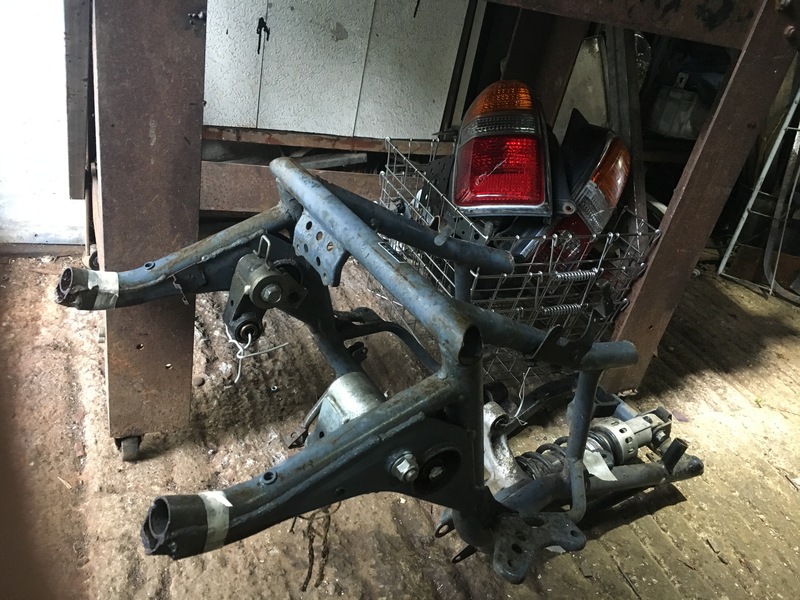 Rear of the main chassis frame removed, rear of the Skywave frame on the floor waiting to be welded into place. Skywave rear frame, marked and prepped for more surgery. Being a scooter, the Skywave running-gear is a unitary engine, transmission and swing-arm. 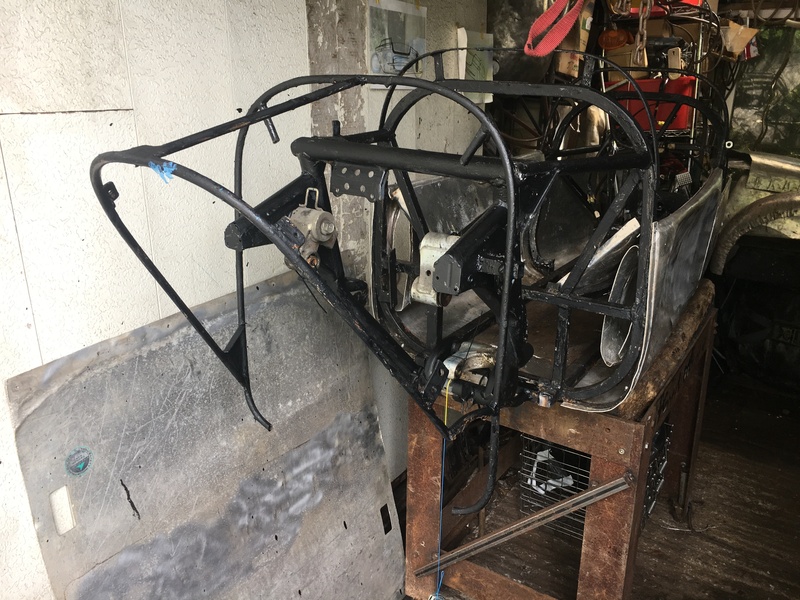 To ensure that it is centrally mounted in line with the chassis, the rear part of the 3-wheeler frame has been cut away and the necessary section of the donor Skywave frame welded in its place. 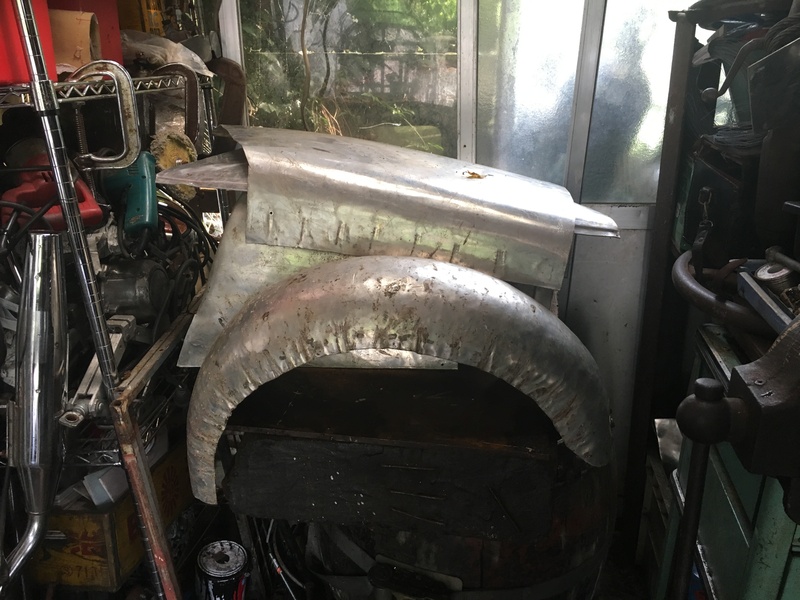 For now they are just tack welds but, once Haruyama-san is sure everything is in line and the spring/damper unit location is fixed, it will be fully welded and gusseted for strength. Skywave frame tack-welded into place, plumb-line and centre-line to check the position. 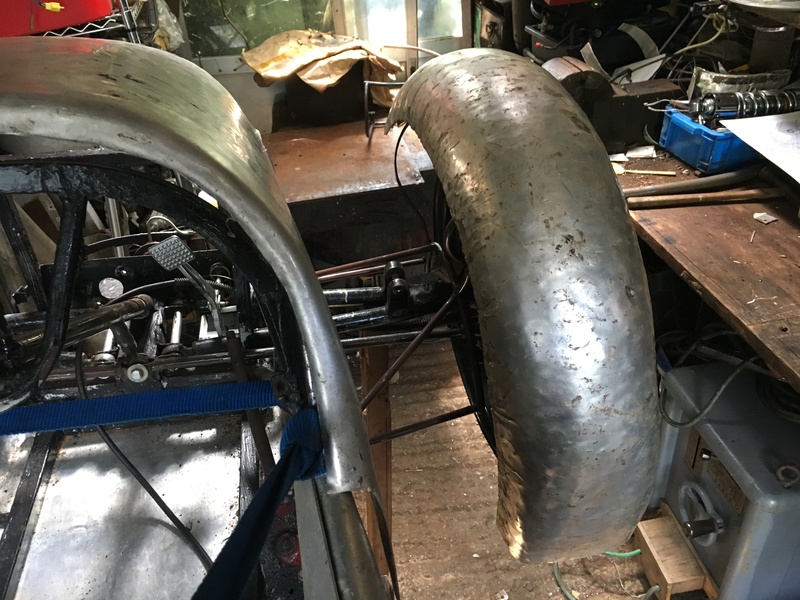 The new spring/damper location will be under the seat, which might need some reshaping for clearance. 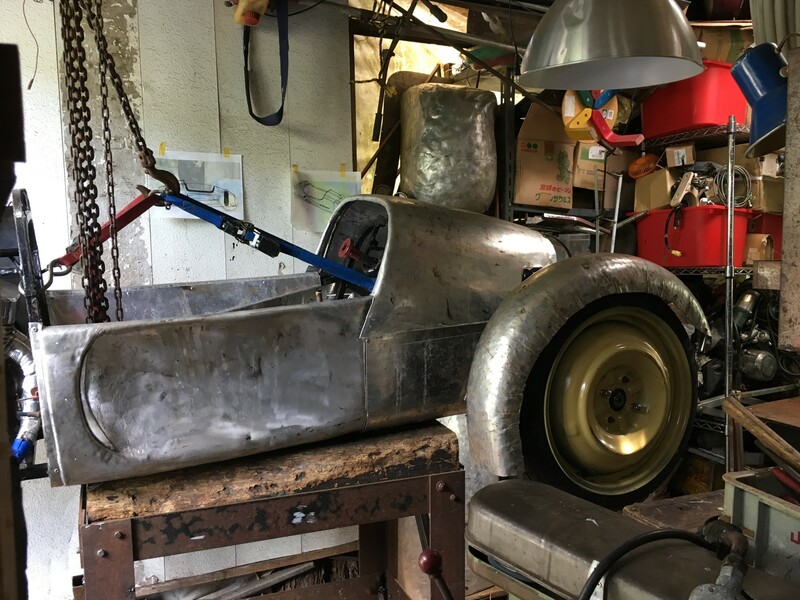 Once all that is in place, we can get the 3-wheeler back on the ground, do a final check of clearances and overall stance and then get back to the bodywork, so probably a one-month total setback.